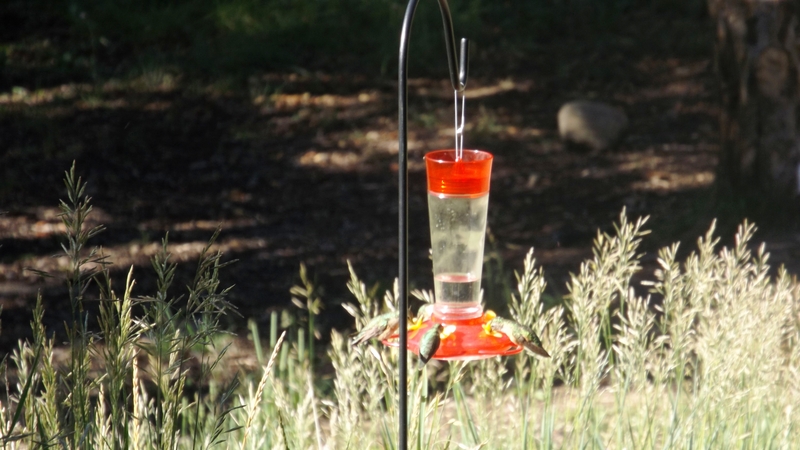 Over the years we’ve put out many hummingbird feeders, typically with little success. But out west, hummers love our offerings. We have seen three different species that never venture as far east as Dallas: black-chinned, rufous, and broad-tailed hummingbirds. Broadtails fan their tail feathers like a poker player holding his cards not so close. Black-chins have that color on their throats rather than the typical crimson. 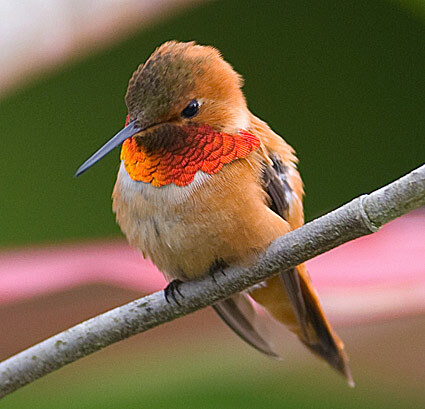 Rufous hummingbirds, the baddest of all the hummers, feature burnt orange males with white collars and red throats, and green and orange hens. Hummers are hungry every day. Our feeder has been a smash hit. So many birds visit that the Kat replenishes it daily. That’s a cup of water with four tablespoons of sugar ever 24 hours. We must be feeding every hummer within a mile radius, right? Not so fast, my friend. The Google says hummingbirds spend so much energy that they need to consume their weight in nectar nearly every daylight hour. Still, we’ve often had seven or eight birds fighting over five sugar ports countless times. And do they fight! A rufous hen took over our feeder for several days and did her best to drive off every other hummingbird looking for a drink. She was a normal-sized bird at first, but after hogging the sugar for several days, she became noticeably plump. She got so fat and bellicose that we named her Cheney, after our former Vice-President. She had his posture and even his chin tilt. And above all, she was a hawk. They all fight most of the time, except for a few broad-tailed hens, who could be sisters from this summer’s hatch. The roosters spend more time jousting than feeding. In fact the males rarely perch, usually hovering to sip the sweet juice. According to Google, hovering uses the most energy of all a hummer’s moves. The birds form alliances, and most attacks are two on ones, sometimes three on one. Their aerial tactics include 80 foot vertical climbs followed by power dives that they pull out of a foot or two above ground. They routinely survive 7G direction changes (3G’s in a flight suit is about the limit for humans). We saw no combat casualties, perhaps because it’s hard to impale something airborne that weighs almost nothing. We spend more on our military than the next eight nations combined. We spend over twice the sum spent by the next two big spenders, China and Russia (who may feel our huge military requires them to try to keep up). We have been outspending them on a large scale for decades – meaning we have a massive surplus weapons inventory advantage. So many of our resources go into defense that our economy is becoming vulnerable. Our debt is more dangerous than Russia. If we cut the defense budget by just 15% , we’d still outspend the next five nations combined, and we’d free up $120 billion annually for investment in education, research, and infrastructure. Another benefit would soon follow: some of those whose business now is to hurt people and break things would redirect their energies toward helping people and making things. Love this post! Good political commentary and excellent hummingbird report. The photo of the rufous male is a stunner. We used to have many hummingbird feeders in our yard in NC and at the peak of the summer would host dozens of the dueling creatures. They don’t fight quite so much when there are many feeders to choose from, but they do tend to pick favorites. I thought I knew a fair amount about hummingbirds, but I’ve never heard the males and females called roosters and hens! Is that just something you came up with or the actual nomenclature? Roosters and hens applies to most birds. Male turkeys are toms or jakes, but I think the females are called hens. We could consult The Google, Em, but where’s the fun in that! Glad you liked the post. 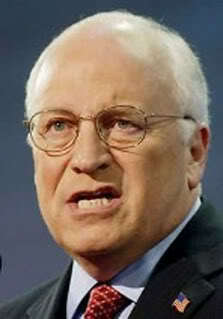 Old Cheney was fun to watch, well, at least the Cheney in Colorado. 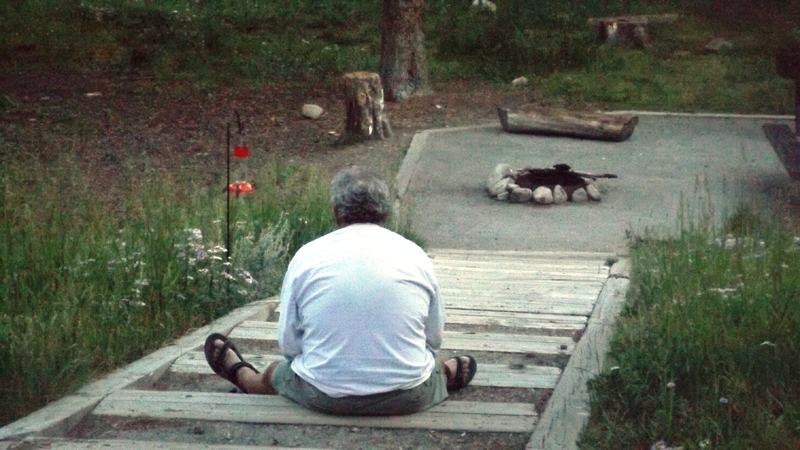 Enjoyed reading here, and seeing the pictures (except for the one of human Cheney). Have you seen this, from 2011? It is a TED Talk by Louie Schwartzberg, comprised mostly of one of his amazing videos. His talk is short, but worth hearing. If you are impatient to jump ahead, the video starts a little past 1/3 of the way through. Finally found your blog. Loved the birds. Hope Stephanie is or was able to join you. Take care!